The water in your Tuttnauer autoclave plays a very important role. Without water there would be no steam. And without steam, proper sterilization can't occur. And without proper sterilization, well, you know what THAT means - you're in big trouble! Here are troubleshooting tips if you're having trouble with your Tuttnauer gasoline water pump. It could be that the fuse is just bad. Use an ohm meter to test it and if it needs to be replaced, install a 1.2 amp fuse. Check the power leads that run from the diesel high pressure water pump solid state relay to the pump itself. Look for loose or pinched wires. If the problem isn't the fuse or the leads, the next thing you need to do is determine if the problem is with the water pump, the solid state relay, or the control circuit. Turn off the power running to your autoclave first and then remove the wires that are connected to the portable gasoline water pump solid state relay on terminals 1 and 2. Now, using those same two wires, connect them together and turn the power back on. If the water pump comes on then it's either the relay or the control circuit that's malfunctioning. 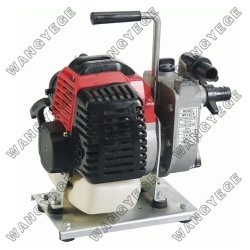 If the pump does not turn on, then it's the pump itself that's the problem and you'll need to replace it. Use a volt/ommeter to test the control circuit between TP13 and TP1. If it reads between 10 and 12 volts DC then the signal that tells the relay to turn off is working. When it reads 0 or 1 then it's also telling the relay to turn on. If it's anything else then you have a problem with the control circuit. If the signals are correct, then perform the same test on terminals 3 and 4 on the relay. And incorrect signal on the relay means you have a problem with the Ajunc board and you'll need to replace it.